Independently tested and certified to EN 114450-S2. In-House tested 30 Minutes fire rating certified NT-017 Paper. Lighter weight design for easier installation. Fitted with EN1300 double bitted high security keylock. Two fixings in base and rear of safe. Option electronic or combination locking. 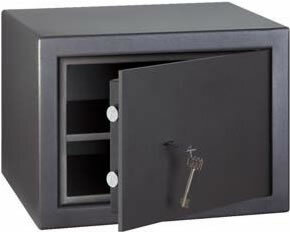 The Zentryguard is one of the best value home/office safes on the market today. Unlike many other safes they are independently certified to EN 114450-S2 4k cash rating, a requirement of many insurance companies. For added protection against fire, they come with a 30 minute NT certified fire rating. To ensure EN 114450-S2 compliance, these Zentryguard safes have been fitted with EN1300 double bitted high security keylock. A high security electronic combination lock can be fitted as an optional extra.